This past Sunday, we got together with 18 of C's nearest and dearest friends for her birthday! Yeah, this kid loves a celebration. 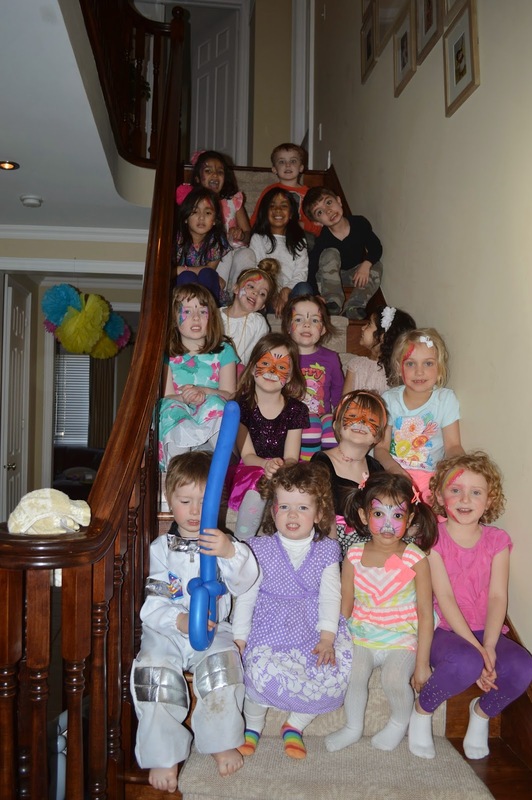 All she wanted for her party though was a face painter and a long party at home. So that we did! 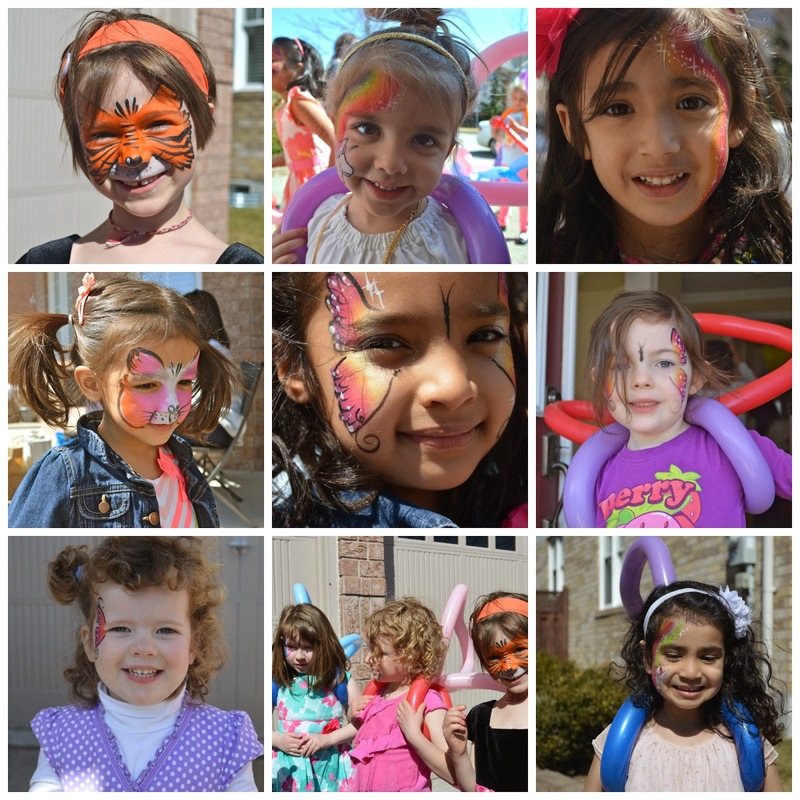 When she said that she wanted a face painter, I found this company that does face-painting but also balloon animals and games- Bre Creative if you're in our area. 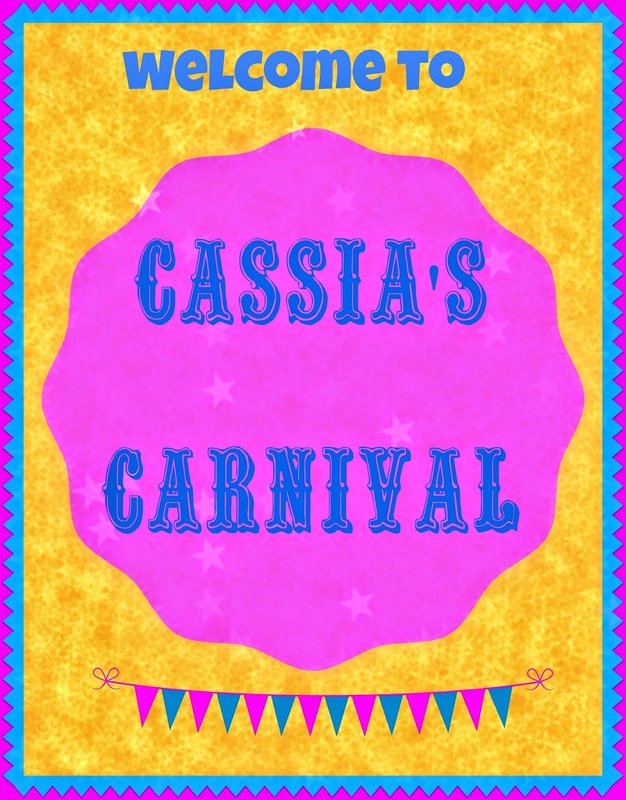 And therein, Cassia's Carnival was born! I sucked at taking pictures of the decorations, the eats and the treats this time but here are just a few. And because I totally mind people's business when it comes to party stuff, here are a few details of ours. I didn't want to go crazy spending lots on decorations and I wanted it to be Carnival-esque but still girly so with a little help from Mr. Youtube, Ms. Etsy (like how I stereotyped them?! ), the Dollar Store and my printer, I did my own. A little sign, banners, tassel garlands, menu cards and tissue pom poms and there we were! I also tried my hand at tim-bit cake pops (and may have uttered a few choice words in the making process)- There were a hit with the six and under group though! This is where I fell short this time--- no pictures of what I personally think are fantastic tablescapes! Wasn't she talented--- and pretty quick too!! While their parents had some snacks and drinks (and kept an eye on their kids) the clowns kept them totally busy. The kids had so much fun! While one clown painted, the other played games with them like can- bean bag toss, a three legged race and a few others. The kids were so thirsty from their sugar induced running around- they drank more apple juice than the adults drank their beverages! And then some mayhem ensued with the balloon animals! When this was done, we went inside and C tried to organise a game of her own which was a little confusing and a little bossy so we sent them to the backyard instead for some more running around and fun! In between the running around, parents fed their kids and themselves… the turkey sliders and hot dogs were a huge hit! And then there was cake!! One shot of all the kids before everyone left! I kept their take home very simple with a colourful candy skewer from a local candy store. A few friends stayed late to help out with the cleaning up and have dinner with us. Pizza upon the birthday girl's request and veggies on the parents' request! This was seriously one of the easier and more fun parties we had! Like the little engine that could, I chugged a little bit every night for a couple weeks so I didn't run around like a crazy person the day off. Every the dips were made the day before so it was basically set up the day of. Both adults and kids had a fun time, which isn't always the case with parents sometimes having to run around after their offspring. But most of all, Cassia declared it the best day ever!! And said that her friends told her the next day-- 'wow, that was a really great party!' High praise in the kid world. And now she's planning her seventh birthday! Linking up with Annie and Nat. Adorable! Those clowns were worth their weight in gold. Such a great idea! The colors looks beautiful, the kids really enjoyed the face painting, the clowns sure made them laugh a lot and the food looks delicious . Well organized and what a perfect carnival 6th birthday party!!! GOOD JOB!!! Looks like a good time! Thank goodness for warmer weather so you could be outside! Such a cute party! Happy birthday princess!! What a cute party! My girls are really into face painting these days too. What a FANTASTIC party! My girls would've been in paradise. I really need to check out that corn dip recipe too! I love this idea as a party theme! May have to steal it for the future! So much fun! What a fun party concept! Happy Birthday once again to Cassia :) Sarita, I'm going to have to try your Hot Corn-Dip recipe asap. LOVE the carnival theme!!!! Great job! The clowns did a great job with the face painting! 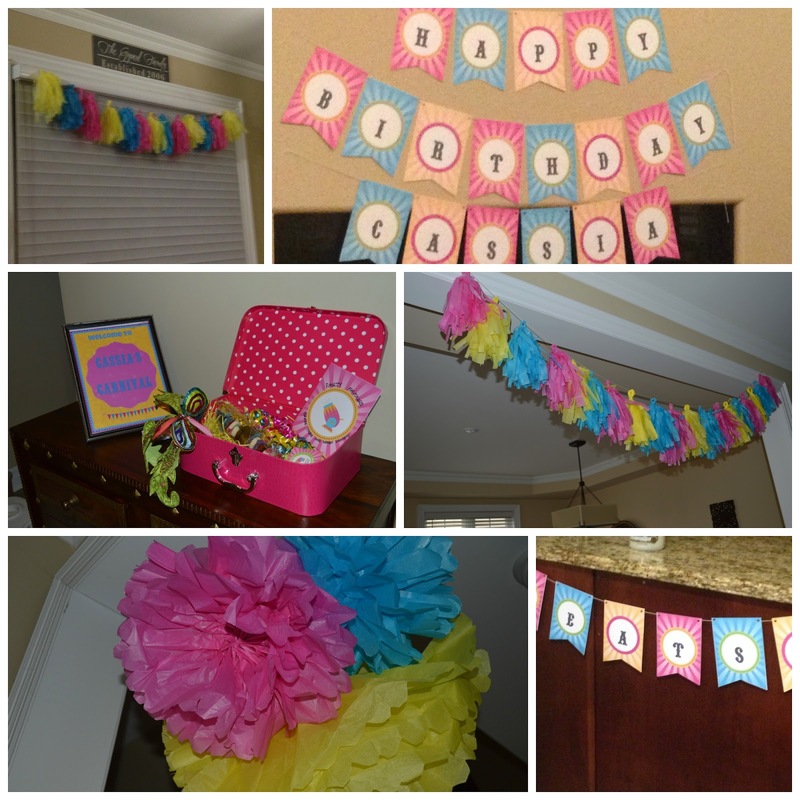 How cute birthday party theme! I love this. I am glad that everyone had fun time in this party. Pretty soon I am also going to host such a cute party for my niece. I have decided on one of the best LA venues too for this party!